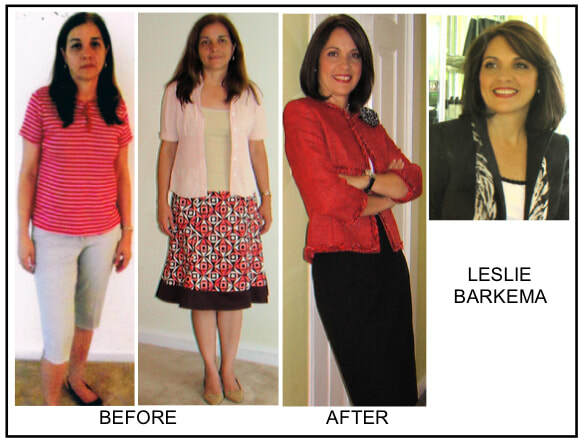 Lisa loves helping clients look their best, whether it's determining your strongest wardrobe formula with a "STAR in Your Own Closet" day (click STAR for more info), branding through total image, or personal shopping for busy executives & Moms. No matter what your budget, we'll create your best look, an empowering presence that projects confidence. "I especially enjoy working with ladies who're always shopping & have nothing to wear or who hate their closets and shopping! I love helping them see how easily & quickly you can package your most impressive appearance every morning... even on a budget!" Job candidate JOLLY JENSEN took her Makeover to the airways. Check out her TV reveal below! "BACK TO CLASS" MAKEOVER INFO! Seminole County teacher in our annual Back-to-Class MakeOver contest. For the full, downloadable information/entry rules page, click HERE. Our 2018 Orange Appeal Magazine Teacher Makeover Winner was JILL PIONTKOWSKI, a life science teacher and Science Department head at STEM-based charter school Orlando Science School. Jill is passionate about teaching her students thought-provoking subjects in a supportive environment. "My approach to teaching is to create an atmosphere where students feel safe to fail. What I mean by that is, in science (and life), many times we learn more from our failures than our successes, and I want my kids to be encouraged to try no matter the outcome," she shares. Jill found out about the makeover contest from her father, who heard a spot on 90.7 WMFE. "He just heard about the school supplies. Of course, he didn't hear anything about the makeover," she says. 90.7 WMFE donated a car-load of school supplies for Jill to bring to her students! Excited to update her look heading into to the new year of teaching, Jill explains: "I was more casual. I would wear funky T-shirts and suspenders with slacks. I wanted to upgrade my look because I'm the department head for science and I'm one of the two sixth grade team leads. So, since I'm in more of a leadership role, I wanted to convey that through my wardrobe." In addition to a $500 The Mall at Millenia gift certificate and the car full of school supplies, Jill won a day-long video closet analysis with Lisa Maile, a beauty makeover with stylist Ana Yebba creating a new hairstyle and Leslie Christin applying the perfect makeup, and a photography session with award-winning photographer Sharon Lundberg. After 3 days of pampering, Jill was thrilled: "I feel amazing! All over, head-to-toe amazing. I had the best time & learned so much. It was exciting to get such a great reaction from my fellow teachers, too." Her entire makeover story was featured in the Sept/Oct 2018 issue of Orange Appeal Magazine. Watch Jill's 3-day makeover video below! Check out Jill's "Big Reveal" on Fox TV 35! HERE'S 2017 TEACHER MAKEOVER WINNER, SILVIA SCHENK!